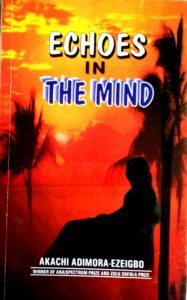 Echoes in the Mind is a collection of short stories ranging from the ordinary to the bizarre. In this realistic portrayal of life in its varied facets, Akachi Adimora Ezeigbo, with gripping intensity, imaginative tenaciousness and a dexterous style so uniquely hers captures an array of believable characters and familiar environment and places, all active participants in real life situations. The stories are short, witty and racy. They reflect Nigeria’s historical and contemporary terrain and are written with a great sensitivity to the complexes inherent in human behaviour.